Marquee Nightclub and Dayclub is one of the biggest Las Vegas Clubs. Located in the stunning Cosmopolitan this Las Vegas Club is indoors and outdoors with amazing hot tubs for the dayclub. This club is absolutely stunning! If you are in Vegas looking for a good time Marquee at the Cosmopolitan definitely won’t disappoint. Marquee Nightclub & Dayclub is one of the hottest spots in town and whether you are here for a birthday, bachelor/bachelorette party, or just for fun get ready to party the night away. In order to get into this mega-club you will line up behind velvet ropes and escorted into an elevator that will take you the party. 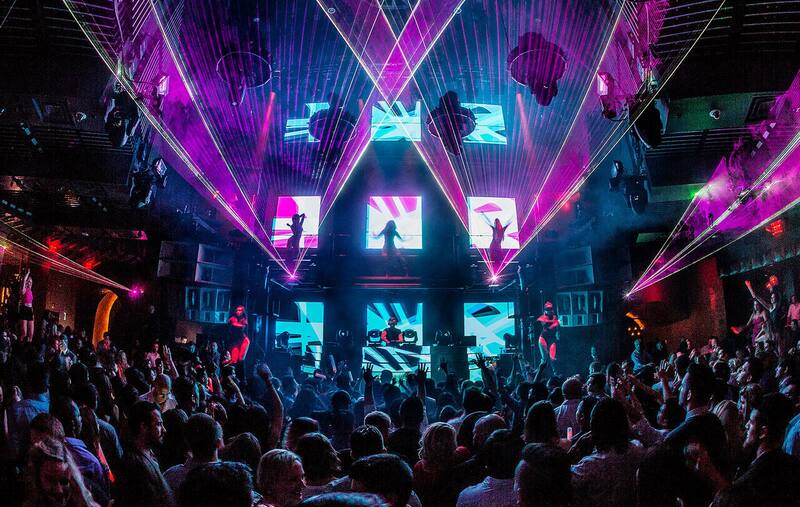 The main room at Marquee is an amazing open room with decor that will blow your mind. Marquee combines the look of an ultra-lounge and the sound system of a nightclub, which, gives Marquee the ability to hold its own against all the other amazing clubs vegas has to offer. Marquee was designed by pulling inspiration from multiple backgrounds. Designers decided to give it the party scene of L.A. and the luxury and class of New York nightlife. This is the kinda dance club that you start your night, and end it too! Most likely you won’t feel the need to leave when you are dancing the night away to some of the hottest EDM producers in the world like Porter Robinson, Dash Berlin, and Carnage. This Cosmopolitan Las Vegas club is much more than just a main attraction or a one-room wonder. However, if house music isn’t quite your taste, Marquee also offers the Boom Box which has various styles of music. The upstairs room, The Library, is a discreet VIP hideaway that offers bottle service and a place where you can relax away from the crowds. Club Marquee Las Vegas has amazing views through beautiful glass window-walls guests will enjoy a nightlife experience unlike any other. It’s the perfect place to spend your Sin City vacation! Guest List is Fridays, Saturdays, Sundays, and Mondays with free entry! Sign up on our Marquee Las Vegas Guest List today! Attire / Dress Code: Upscale and trendy. Men must wear button-up, collared shirts. Check out our Events Calendar and see what’s happening at Marquee Nightclub Las Vegas and view the Dress Code!